Screen 1: The patches you sample with the Auto Sampler helpfully appear in their own sub-directory in both the Library Browser and EXS24. In October 2018’s Logic workshop we used MainStage’s Auto Sampler to sample hardware synthesizers, turning them into EXS24 patches. This time, we’ll collate these patches in Logic’s Track Stacks to create keyboard splits and layers, and then import them into Alchemy for spectral manipulation. To use your patches in Logic, create a software instrument and add an instance of EXS24. Open the Library Browser and you should see ‘Auto Sampled’ as the top category for EXS24 patches. Click on it to reveal your patches. You can also find your Auto Sampled patches in the EXS24 GUI’s main drop-down menu (see Screen 1). 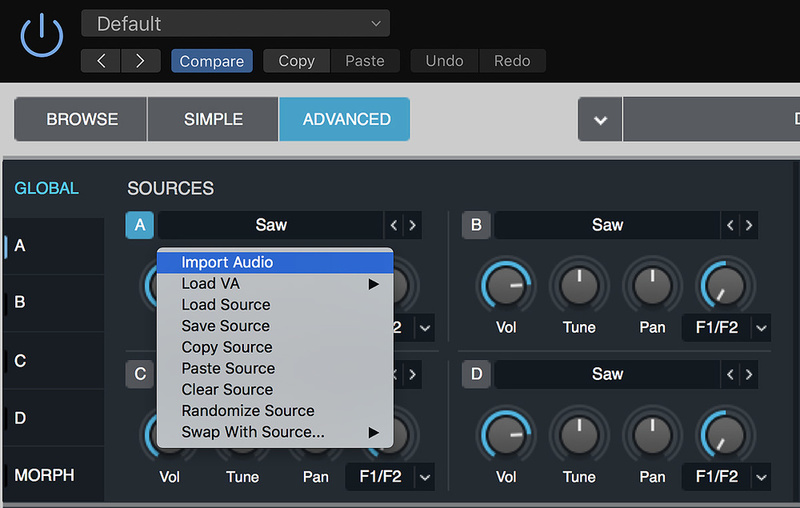 In the example project [available to download from the sidebar of this article or 'Logic Project' box at the end], look for ‘SOS Auto Sampled Synths’ in the same menu. If you had already opened Logic and then run the Auto Sampler in MainStage, your new patches will not be displayed. To fix this you need to go to the EXS24 GUI’s main drop-down menu and click the Refresh Menu option. If at any stage you want to remove any of your Auto Sampler patches, they are stored in the following location: Macintosh HD/Users /YourUserName /Music /Audio Music Apps /Sampler Instruments /Auto Sampled. Your samples are stored here: Macintosh HD/Users /YourUserName /Music /Audio Music Apps /Samples /Auto Sampled. The downloadable Logic project has two tracks and Auto Sampled patches for you to build a track stack with. The first track is a patch taken from my Moog Sub37 and is the raw sound of the two main oscillators set to sawtooth waveforms with a sub-oscillator applied. The next track is an Auto Sampled patch taken from my Dave Smith Prophet Rev2 — named after film composer Vangelis, it’s the first patch on the synth and it approximates his famous synth sound from Blade Runner. From here I‘ll refer to these as the Moog patch and Prophet patch. Open the accompanying Logic project and try out the Moog and Prophet patches for yourself. The Moog patch makes a great bass sound as it’s solid and powerful without being harsh, whilst the Prophet patch makes a great polysynth sound for playing chords or melody lines. On the Moog track, open the EXS24 editor and begin by tweaking the Moog patch so it feels more like the original keyboard patch. Go to the Level Slider and drag the lower limit to the top. This will stop the patch being sensitive to velocity and ensure a constant level in the bass part. The Moog is a monophonic synth so let’s follow that behaviour with the EXS24. Go to the top left of the EXS24 GUI and set the Keyboard Mode to either Legato or Mono. Both of these settings will be monophonic, however the Legato option will only retrigger the EXS24’s envelopes when you play in a staccato manner. Now that we have the bass sound feeling like it did originally, let’s combine it with the Prophet so that we can play the Moog with our left hand and the Prophet with the right. 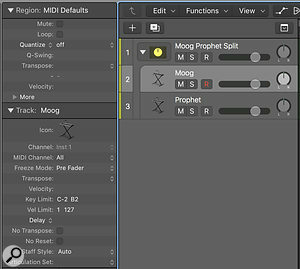 Select both the Moog and Prophet tracks and Ctrl-click on one of their track headers. From the pop-up menu choose Create Track Stack, and from the next menu choose Summing Stack. Rename the track stack ‘Moog Prophet Split’. 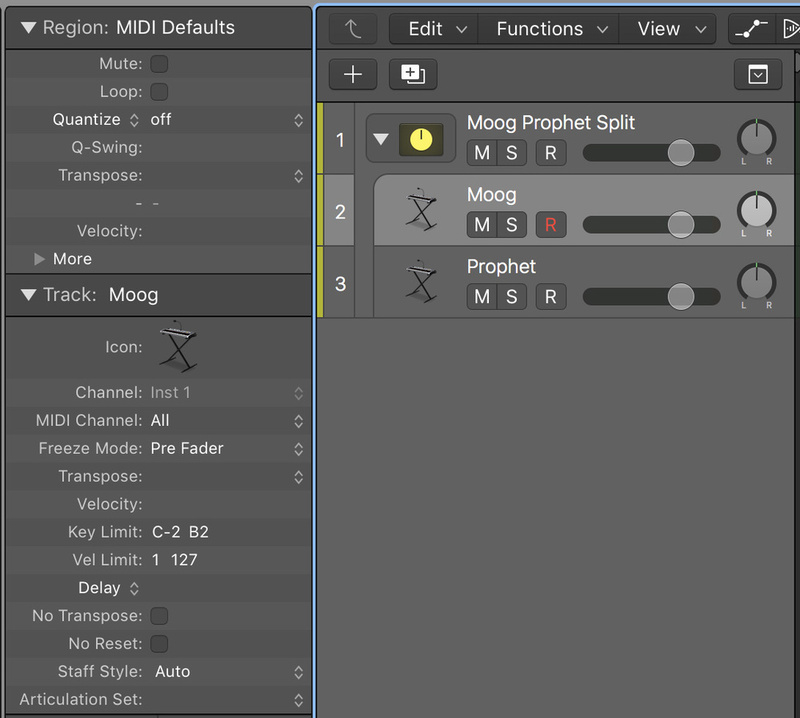 To create a keyboard split, click on the nested Moog track and go to the Inspector. From the Track area go to the Key Limit field and enter C-2 B2 (see Screen 2). Now go to the Prophet track and enter C3 G8 for the same field. When you record enable the track stack you should hear the key split when you play your MIDI keyboard — a Prophet and Moog combination makes for a huge sound! Screen 2: You can add keyboard splits to a track stack by going to the Inspector’s Track section and inputting the desired key range into the Key Limit field.One nice feature of the DSI Rev2 is that it can have two layers, each with its own sound on. The sound designers at Dave Smith Instruments often use this to fade in a second layer at a different pitch. Let’s emulate that in our Track Stack. First, select the Prophet track and click the Duplicate Track button. Go to the Inspector and set the Track / Transpose field to +12 and then open the EXS24 GUI and set the attack time of Env2 (the amplifier envelope) to around 4000ms. Record enable the track stack and play your keyboard: you should now hear a second higher Prophet part fade in over the lower one. To finish off the track stack add reverb and delay busses to it, add effects and mix to taste. Once you’re happy with the sound, it’s a good idea to save your track stack by clicking the Save button in the bottom right-hand corner of the Library Browser so you can use it in other projects. Although the EXS24 is a capable sampler, its sound-mangling potential is rather limited. Fortunately for us Logic has a much more capable synth, Alchemy, which can import an EXS24 keymap into any of its four oscillators. This gives Alchemy the potential to layer up to four EXS24 keymaps all inside the same synthesizer and mangle them with a wealth of advanced manipulation features. Instantiate Alchemy on a new software instrument track. Open the plug-in GUI and from the File menu choose the Initialize preset option. 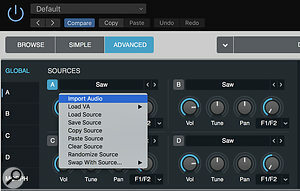 Next, go to the Advanced view and click on Oscillator A’s source drop-down menu and choose Import Audio (see Screen 3). From the browser, navigate to the Auto Sampler directory and choose Import to analyse and load one of your EXS24 patches. By default, Alchemy will analyse your keymap in Spectral Mode and load the result into Oscillator A (for more about the different analysis modes see the January 2016 Logic workshop: https://sosm.ag/jan16logic). Screen 3: Alchemy offers many more powerful synthesis options than EXS24, and it can import your Auto Sampler keymaps. Simply go to any oscillator’s source drop-down menu and choose Import Audio.Now, let’s look at changing the character of the sound in a way that can’t be achieved in the EXS24. In the Advanced view, click the A on the far left of the GUI, then open the Formant tab. From the Analyzed section drag the Shift knob up to alter the timbre of the keymap. I took the same Moog keymap I used earlier and made it considerably thinner by turning the Shift knob up to +11. Let’s also add some movement to the sound: Ctrl-click on the Shift knob and from the drop-down menu navigate to Add Modulation / LFO / LFO1 (sine). This will assign LFO1 to modulate the Shift parameter. The Modulation section will automatically switch to display the modulation assignments of the Shift knob. From here turn the depth of the LFO modulation up to +12, then from the centre of Alchemy navigate to the LFO panel and set the Rate control to two bars, so the modulation adds a sense of slow, evolving movement. Now add effects and other modulation to taste. Another potentially more immediate way to explore manipulating keymaps with Alchemy is to find a preset that already contains interesting modulation and then replace all of the existing oscillator assignments with your EXS24 keymaps. Load the Pads / Aether Choir preset (you may need to navigate to Logic Pro X / Sound Library / Open Sound Library Manager to download Alchemy’s additional patches to find this). Try out the two X/Y pads at the bottom of the Alchemy GUI. Now that you’re familiar with what the assignments do, replace the factory assignments for oscillators A-D with your own keymaps by using the Import Audio command we used above. Once again, play the patch and use the X/Y pads to mangle the preset: you can very quickly audition a range of different manipulations that would otherwise have taken a long time to program from scratch. There are many advantages to using the Auto Sampler to capture sounds from hardware synths and bringing them into Logic. For example, you can turn mono synths into polysynths or capture a preset from a synth without patch memories so you can replay parts later in the songwriting process. In addition, you can layer and split different Auto Sampler patches without hardware restrictions. And, if you’re a laptop user, it also allows you to take snapshots of your favourite presets from your hardware synths, allowing you to have the sounds with you at all times. Click below to download the Logic project that accompanies this article.